Product Reviews | Relaxed. Transitioning. Natural. Beautiful. Three months ago, after almost six years of being natural, I decided to texturize my hair! I purchased the Silk Elements Texturizer for Sensitive Scalps. This is a no-lye, no-mix, texturizing system for people with sensitive scalps. I purchased the version for coarse hair, but it also comes in regular as well. You can see my initial application and results HERE. I just applied my second texturizer to my hair two days ago (at the 3-month marker). Moving forward, I plan to texturize my hair every 4 months. ♥ I can achieve customized results because texturizers process less quickly than relaxers. ♥ My hair accepts product much more easily. ♥ My strands are smoother. ♥ My hair is softer. ♥ My styling time has decreased. ♥ The manageability of my hair has improved. ♥ My hair requires less product. ♥ My hair tangles less/is easier to detangle. ♥ I don’t have to DIY all of my hair products. – Is a chemical/mild relaxer. – Has to be applied carefully (and properly) to avoid hair damage. – There is a learning curve to achieve consistent/desired results, depending on the texture, density, and thickness of one’s hair (as well as one’s personal preferences toward the final look). Watch the video below to get an update on what it’s been like for me being texturized, and find out whether I regret my decision. Want to see how I initially applied my texturizer? Curious about my initial results? Watch the video below for the full deets! After almost 6 years of being natural, I decided to texturize my hair! I purchased the Silk Elements Texturizer for Sensitive Scalps. This is a no-lye, no-mix, texturizing system for people with sensitive scalps. I love that the formula contains a combination of silk protein, aloe vera, panthenol, and pro-vitamin B-5. I purchased the version for coarse hair, but it also comes in regular as well. To best prep my hair for the texturizer, I applied the protective gel around my hairline, ear, and nape. Because I have an extremely sensitive scalp, I also took the extra step to base my entire scalp by dividing my hair in quadrants and applying the protective gel to each part within each section. If you don’t have skin as sensitive as mine, you can skip this step. However, if there is even a chance that you do, I highly recommend that you base your scalp to prevent any chance of a chemical burn. Also, I recommend buying better quality gloves. The ones that come in the box are okay but are quite thin. I applied the texturizer, first to the back of my hair, around my hairline and then to the front of my hair. Then, because my whole head had virgin hair, I applied the texturizer to the length of my hair. Unfortunately, I got scared and rinsed the texturizer out too soon, so my results are pretty subtle. However, after less than one day, I noticed a change in the texture and condition of my hair. My hair accepts product much more easily now, and is significantly softer and smoother. So, next time, I will leave the texturizer in for the full length of time (maybe longer). Watch the video below to see how I applied the texturizer and to check out my results. After 5 years and 9 months of struggling with my natural hair, I have made the decision to texturize my hair! I did not make this decision lightly and have come to this conclusion after much research and angst. I decided to go with the Silk Elements Texturizer for Sensitive Scalps. This is a no-lye, no-mix, texturizing system for people with sensitive scalps. Watch the video below for more information, explaining my decision. I’ll post a video of my results in the coming weeks. Vitamin A, Vitamin C, Vitamin D, Vitamin E, Vitamin B-6, Folic Acid, Vitamin B-12, Biotin, Pantothenic Acid, Iodine, Zinc, Choline, Inositol, Glucose Syrup, Sugar, Water, Pectin, Citric Acid, Sodium Citrate, Natural Flavors, and (for Colors: Titanium Dioxide, Blue 1), Coconut Oil, and Carnauba Wax. As a dietary supplement, adults take two (2) gummy vitamins per day. Chew thoroughly before swallowing. Do not exceed recommended dose. Keep out of sunlight. Store in a cool, dry place. Color may fade over time. Color changes do not affect the safety of the vitamins. I just finished up month #3 of my three-month trial of SugarBearHair Hair Vitamins. Go HERE to read my initial review and to watch a video of my first impressions. You can also chart my two-month progress HERE. So far, these hair vitamins still taste, feel, and smell just as amazing as on day 1. The fact that this hair supplement comes in gummy form makes them a hassle-free addition to my morning routine. I love that! According to the company website, the active ingredients of this hair vitamin complex will (1) increase circulation while cultivating the proper moisture balance of one’s scalp, (2) expedite hair growth while preventing hair breakage and curbing hair loss, and (3) improve hair strength and elasticity while encouraging an overall boost in energy levels. After 3 months, I have yet to experience any increase in my energy levels. However, I have noticed that my mane isn’t as dull as it was prior to consumption of these hair vitamins. In addition, my hair doesn’t seem to break quite so readily and seems denser throughout. I also observed in month #1 and #2 that my hairline wasn’t nearly as sparse as it had been in the past and had filled in rather nicely. 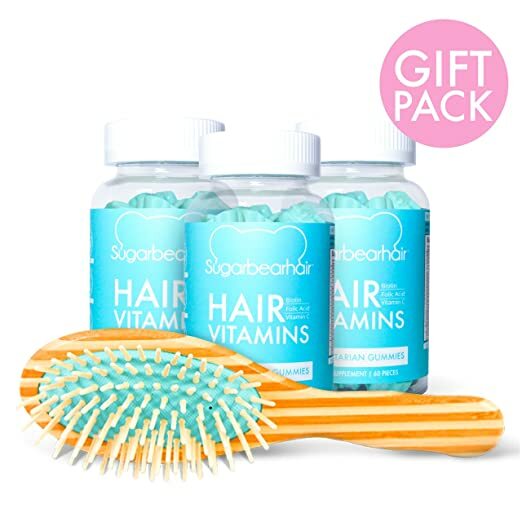 This, in combination with the fact that they helped me to reverse stunted hair growth that I had encountered in the last year or two, has made SugarBearHair Hair Vitamins something of a marvel. Unfortunately, though, I didn’t experience expedited hair growth everywhere. In fact, some months, certain parts of my hair didn’t grow at all (or only grew ¼”) while other segments of my head were showered with ¾” to 1″ of growth! Although my hair growth hasn’t been consistent from month to month, with the help of these little teddy bears, I have finally moved out of my long-term hair non-growth slump and started to retain some length. So, thank you SugarBear! ♥ Vitamins helped me to get over a long-term growth stunt. ♥ Vitamins filled in my hairline. ♥ Vitamins strengthened my hair. ♥ Vitamins provided my hair with much-needed nutrition. ♥ Vitamins encouraged new growth. ♥ Vitamins made my hair more voluminous and thicker at the root. ♥ Vitamins are vegetarian, kosher, cruelty free, gelatin free, gluten free, and soy free. ♥ Vitamins come in a gummy form (no hard-to-swallow large, smelly pills). ♥ Designed for all hair types and genders. ♥ Contains 15 vitamins and natural ingredients. ♥ Flavored from real berries and citrus fruits. ♥ Vitamins are hormone free and won’t affect body or facial hair. ♥ Vitamins can be taken any time of day, together, separate, and with or without food! – No increased energy levels. – Vitamins are quite sweet. – Vitamins are expensive (if not purchased when on sale). Want to know more of my thoughts about these hair vitamins after three months’ of use? Watch the video below to see my three-month length check and to see how these gummies helped ignite my hair growth. I’ve had mixed results with the Garnier Fructis brand. The first time I tried one of their product lines was about a year-and-a-half ago. It was not too long after their Honey Treasures Repairing Shampoo & Conditioner from Garnier’s Whole Blends hair care line came out. However, that shampoo and conditioner wreaked havoc on my hair! About a year later, I tried the Garnier Fructis Style Pure Clean Finishing Paste as a fluke and ended up liking it! I never really tried anything else from their line until my sister gave me a bottle of their Marvelous Oil for Dry, Damaged Hair a while ago. I’ve been using it for the last year. Unfortunately, I just never really had the time to write a blog post about it or do a video review. But, I definitely think it’s worth a mention. 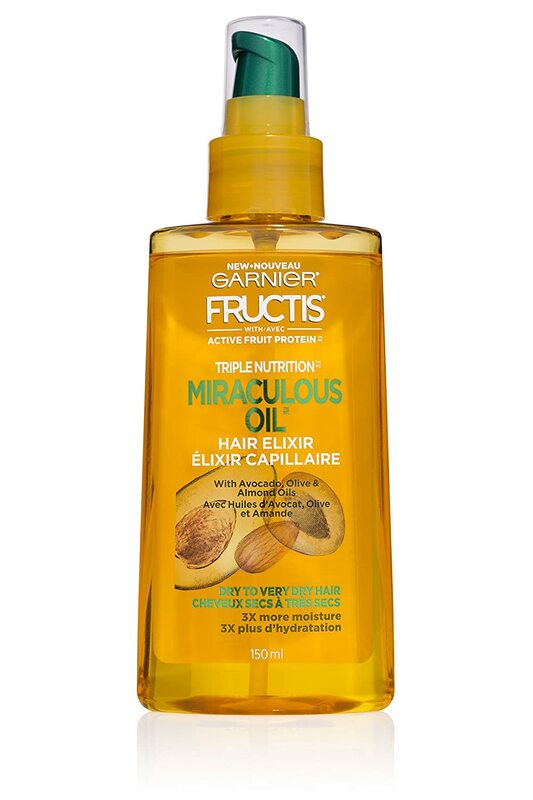 I have since transitioned to using Garnier’s Miraculous Oil for Dry to Very Dry Hair because I couldn’t find their Marvelous Oil for Dry, Damaged Hair locally. I do prefer the Marvelous Oil over the Miraculous Oil, but both are still quite good. What I like best about these products is that they are multitaskers. They act as a (1) pre-shampoo treatment, (2) conditioner booster, (3) blow-dry accelerator, (4) ends finisher, and (5) overnight leave-in. To use it as a pre-shampoo treatment, just apply the product to wet or dry hair before shampooing your hair. The Miraculous Oil acts as a primer to ensure gentle cleansing. Need a conditioner booster? Add a few drops of the oil to your fave conditioner to improve detangling. If you would prefer a blow-dry accelerator, apply the Miraculous Oil to damp hair to expedite the blow dry process. Your hair will dry faster than it would with a creamy leave-in. As an ends finisher, apply the oil to damp or dry hair to smooth frayed ends and tame flyaways. If an overnight leave-in is more your style, just work the product through wet or dry hair and leave in overnight to help restore suppleness and softness to your tresses. So far I have used the Miraculous Oil as a pre-shampoo treatment, conditioner booster, and ends finisher. My hair simply loves this miracle elixir. I love the custom blend of ingredients, too! I especially like the inclusion of sweet almond oil, olive oil, avocado oil, sunflower seed oil, and rosemary leaf extract. It added shine to my hair without weighing it down or leaving behind any greasy residue. It also really helped to transform my dry, dull hair. The oil is super light and is easily absorbed by my hair. I like to sandwich it between my other hair products, (i.e., my hair moisturizer or thicker hair butters like mango butter and shea butter). While this oil smells amazing (slightly fruity with citrus undertones), it contains a high amount of fragrance (in terms of of quantity relative to other ingredients). Nonetheless, the texture is perfect … not overly thick (like castor oil ) and not super thin (like extra virgin olive oil) … The pump top also provides greater control during application. ♥ Oil is lightweight and easily absorbed by hair. ♥ Oil does not leave any greasy residue. ♥ Oil treats dry, dull, and damaged hair. ♥ Oil multitasks as a pre-shampoo treatment, conditioner booster, blow-dry accelerator, ends finisher, and overnight leave-in. ♥ Oil has a pleasant texture and smell. ♥ Pump top provides control for easy application. – If you have type 3 or 4 hair, you may still need to follow up with a heavy butter like mango or shea like I did. – Contains “dimethiconol,” a silicone-based polymer. – Contains a high amount of fragrance.